The majority of news coverage in the weeks leading up to Nov. 8 has focused on the presidential race, but the majority of the ballot is made up of various statewide and local items. In addition to the presidential election, there are local elections, including city council and school board, as well as questions unique to each district. All ballots in Rhode Island will also include the following statewide races and ballot measures. Question 1: Approve or reject a state-operated “Twin River” casino in Tiverton, Rhode Island. Question 2: Approve or reject two amendments to the State Constitution, one in Article III, Section 8, and one in Article VI, Section 5. These amendments will restore the jurisdiction of an ethics commission over members of the state’s General Assembly, who would otherwise be immune to allegations of ethical wrongdoing. Question 3: Approve or reject $27 million in bonds (state loans) to construct a Veterans Home and to renovate existing facilities for veterans. 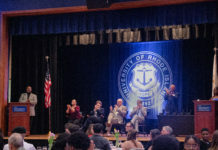 Question 4 Approve or reject $45.5 million in bonds, of which $25.5 million would be invested into the University of Rhode Island College of Engineering and $20 million to the URI Affiliated Innovation Campus Program. Question 5: Approve or reject $70 million in bonds for port infrastructure projects, $50 million for the Port of Davisville in Quonset,Rhode Island, and $20 million for the Port of Providence, Rhode Island. Question 6: Approve or reject $35 million in “Green Economy Bonds,” which would be allocated for: State Park Development ($4 million), State Land Acquisition ($4 million), Bike Path Development ($10 million), Development and Remediation of Brownfields (industrially polluted land) ($5 million), Preventing Stormwater Pollution ($3 million), Local Recreation Development ($5 million) and Local Land Acquisition ($4 million). Question 7 Approve or reject $50 million in bonds for ‘Housing Opportunity,’ with $40 million for developing affordable housing and $10 million for revitalizing urban areas and blight remediation (repairing abandoned or vacant urban properties). For the full text of your local sample ballot in Rhode Island, go to vote.sos.ri.gov. For other states, search for voter information on your state’s website.